In an unexpected trade, the Arizona Coyotes strengthen their center ice position by acquiring 27-year-old Marcus Kruger from the Carolina Hurricanes. 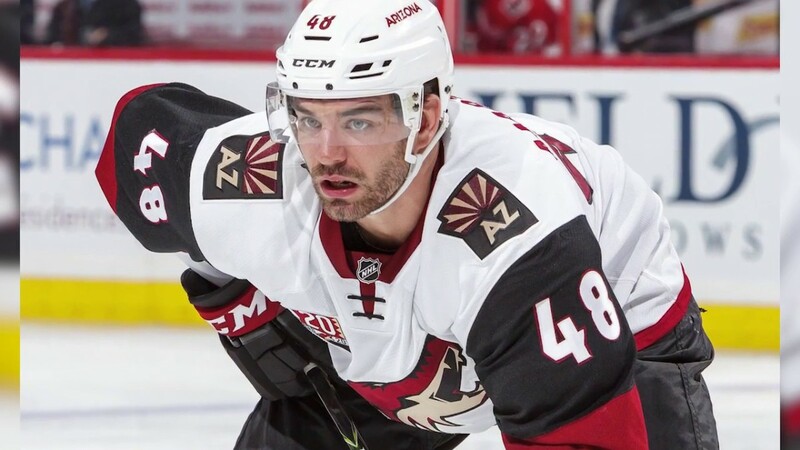 Arizona Coyotes President of Hockey Operations and GM, John Chayka decided to get an early jump on the trade activity by sending fourth-line winger Jordan Martinook to the Carolina Hurricanes for center Marcus Kruger. The two teams also traded draft picks with the Coyotes sending their fourth-round selection to Carolina for their third-rounder. Kruger was waived by the Hurricanes back on Februray 8, 2018 and carries a $3 million cap hit until the 2019/20 season when he becomes an unrestricted free agent. He played 19 games with the Charlotte Checkers of the AHL and tallied four goals, four assists. In 48 NHL games last season he collected one goal with five helpers. He was a member of the Chicago Blackhawks for his first seven seasons gathering 105 points in 398 games. Kruger adds to the growing population of Swedish players on the team. Oliver Ekman-Larsson and Niklas Hjalmarsson also reign from Sweden. Martinook, 25 is signed until the same season, but for a lower $1.8 million cap hit. He is more of a defensive player as he only had six goals with nine assists in 81 games last season. On paper it seems like a pretty even trade, but Chayka seems very satisfied with his new acquisition and mentioned,"We're very pleased to add Marcus to the Coyotes. Marcus is a solid, two-way center who is very responsible defensively and has good speed and skill. He's an excellent penalty killer and will provide us with good depth at the center ice position." Adding Kruger to the equation at center almost makes Brad Richardson expendable due to the fact that he is six years older and will require a larger salary. Richardson played well with Martinook on the fourth line and will become an unrestricted free agent on July 1, 2018. It is hopeful that Kruger will fill that void and be more of a two-way player than Martinook. Are more moves on the horizon? More than likely that will be the case as the Coyotes need desperately to move up in the standings enough to qualify for the post season playoffs. Improving the defense and acquiring a lower draft pick will help the team in their drive to make the playoffs for the first time since the 2011/12 season. Chayka is certainly not shy in mentioning that he will examine more trades to upgrade his team. He also obtained the fifth overall NHL Entry Draft pick in the lottery held recently. It's a deep draft and Chayka expects to acquire a quality defenseman or forward. He hasn't even ruled out trading up or down in the draft to augment his team. He realizes that this team played well over the last 35 games and needs to mold it more to get the results he and ownership seek. Who do you think won this trade? Will it help the Arizona Coyotes improve enough or will more deals need to happen? Let us know in the comments section below.